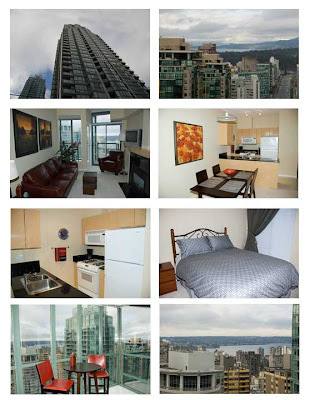 Trips & Treats: I FINALLY have a condo in Vancouver!!! I didn't get a water view like I was hoping for (and I wasn't willing to pay an additional $1,000/month to get it), but I can walk to the water in less than 10 minutes. I did, however, get two outside balconies, a solarium and insuite laundry (yes, that's a big deal in a lot of these buildings). So, I'm thrilled yet a little edgy about this whole Vancouver move. It'll be nice to finally get out there so I can just settle down and start enjoying all Vancouver has to offer (instead of worrying about what to put in storage, what to pack and how to get everything else done in the next week). I was hoping you would choose the crackhouse. LOL I am glad you have a place to live now. I wish I could come out to see you. You are going to have a blast. Cute place you are going to be living in. You seem to be managing everything just fine so just keep doing what you are doing. I didn't choose the crackhouse because otherwise where would you and your family vacation this summer? LOL. I can call and see if it's still available (I'm sure it is). I hope it feels like home soon. Congrats to you on your move. I love your new place! glad you found a place you like. looks nice. Hi, Kurt!!! It looks nice, and I'm keeping my fingers crossed that it actually is nice. Looks like a great place - good luck on the move! We just moved a few weeks ago today, and it will be a LONG time before I even THINK about moving again.